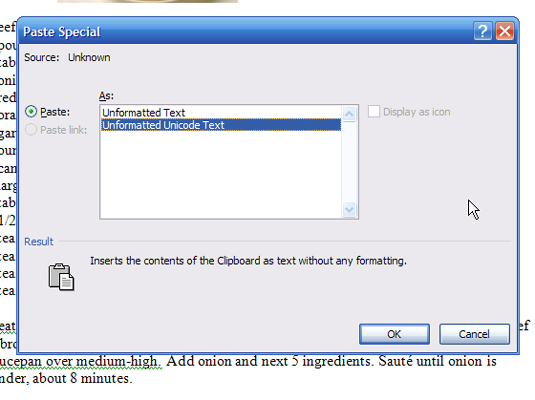 When you want to paste an Excel table into your Word 2007 document, you can use the Paste Special command to position the table in the document. 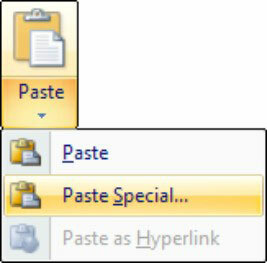 1Click the bottom of the Paste button, located on the Home tab of the Ribbon. The Paste drop-down menu appears. 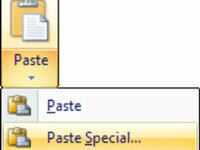 The Paste Special dialog box appears. The Paste Special dialog box lists options for pasting text, graphics, or whatever was last copied or cut; the number of options depends on what’s waiting to be pasted. For example, you can copy a chunk of an Excel spreadsheet and paste it into your Word document as a spreadsheet, table, picture, or text.